Info "Get Donkey Kong out of your garden! Spray him 'til his head hits the beehive." Donkey Kong 3 is one of 9-Volt's microgames in WarioWare: Twisted! It is set in the game of the same name. The object is to have Stanley spray Donkey Kong with water until his head hits the beehive. 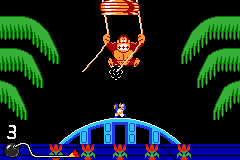 Donkey Kong also swings. Level 1: Spray Donkey Kong three times. Level 2: Spray Donkey Kong four times. Level 3: Spray Donkey Kong five times. This page was last edited on September 27, 2018, at 18:54.